I’m thrilled to share that my workshop “Art-Full Storytelling: Drawing Out Clients” has been selected as one of 25 to be presented at the 2014 conference of the Association of Personal Historians (APH). To anyone thinking about branching into new areas of creativity and work, I say: Go for it. In recent years, I’ve been working on ways to combine my love of storytelling, writing, and art–both for the sheer joy of it and for income. While my professional background is in social services advocacy, I have been trained as a facilitator of ethical/spiritual wills, and have presented writing workshops related to personal stories. I’ve been building a new business model based in helping people tell their stories: even when information is missing, there are wonderful stories to be told, shared, and preserved. Sometimes we need to look at new ways to re-create and re-frame stories, in a way that honors and respects both the story and the storyteller. Here’s the description from my APH proposal: This “hands on” workshop will provide innovative, enjoyable activities related to art, engaging clients in stories and triggering memories. A range of activities and techniques will be shown, tailored to a variety of clients. Activities include writing prompts, color, paints, markers, photos, ephemera, and more. Some activities are particularly suited for clients in early or later stages of dementia, when getting a sense of personal stories can be difficult yet sought after and still valuable. The workshop will help clients reminisce and tell their stories in creative, meaningful ways–maybe not the traditional presentations, but valuable and enduring nonetheless. The goal is to engage through focused creativity, understanding the realities of the brain’s changes over time. I’ll provide an overview of experience with Alzheimer’s patients in early, middle, and later stages, as well as those with no Alzheimer’s symptoms. I will share art exercises that foster connections and evoke memories. My 84-year-old dad has lived in a memory unit of an assisted living facility for nearly 3 years, and I’ve enjoyed learning more stories from him, even as some memories fade. It’s been a powerful journey. I am in the process of getting certified by the Alzheimer’s Association in quality care of dementia and Alzheimer’s patients. 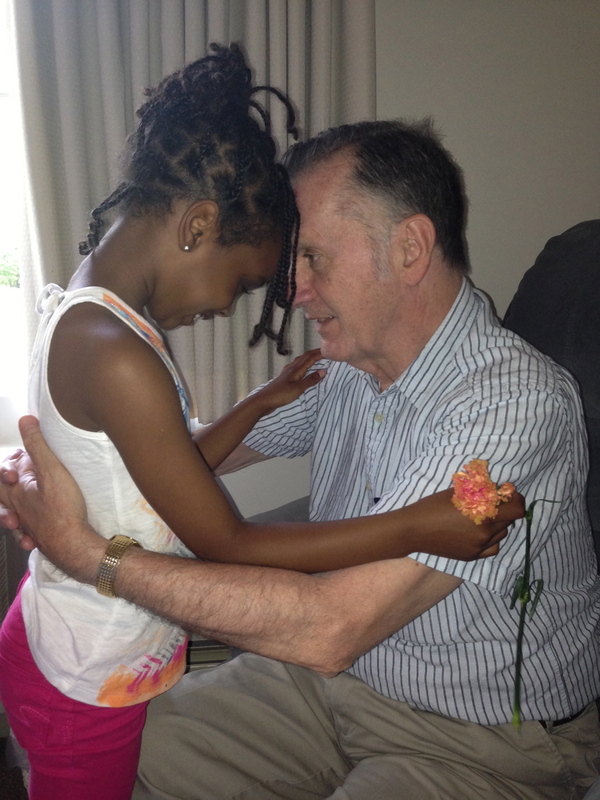 Dad and Z in summer 2013. 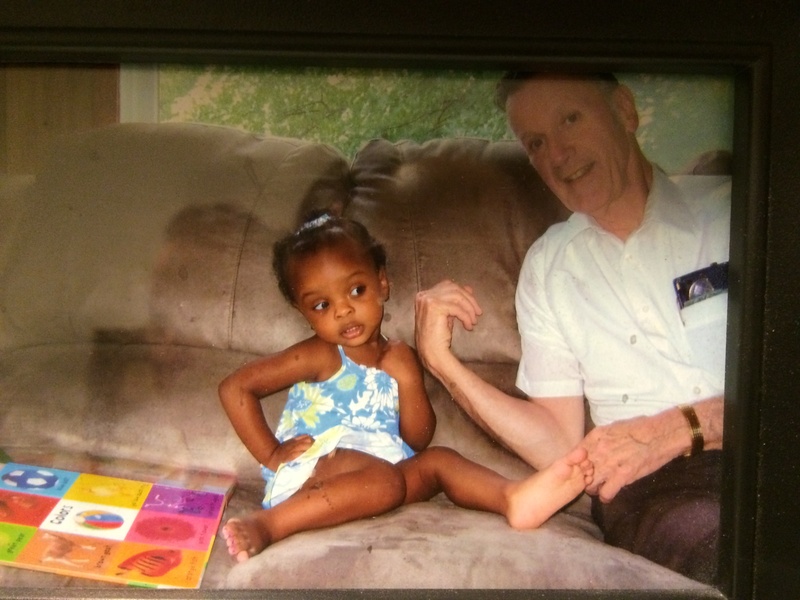 I so love these 2 amazing people–and all their stories. I genuinely enjoy the challenges of helping people fill in missing pieces to create a valuable history. Last year, I presented for the first time at an APH conference. 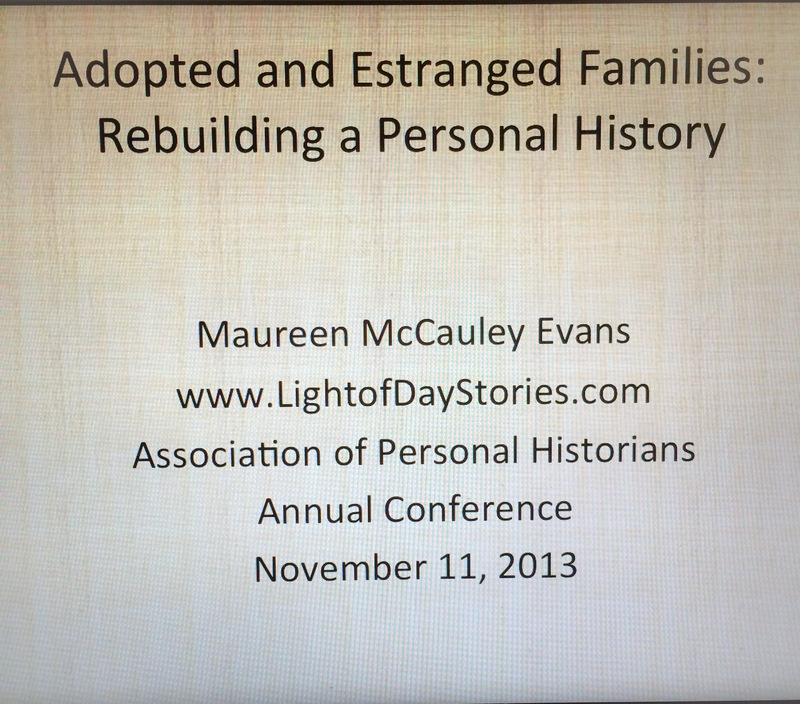 My workshop was titled “Adopted and Estranged Families: Rebuilding a Personal History.” You can read about it here. I’m pleased to say that my 2014 workshop “Finding the Missing Pieces,” a follow-up to last year’s workshop, has been selected as an alternate for the 2014 APH conference, if a scheduled presenter has to cancel. It’s been wonderful to refine and develop strategies for helping folks to tell their stories through innovative approaches. Maya Angelou said it well: “There is no greater agony than bearing an untold story inside you.” May we ask loved ones to share their stories while they are with us. May we help when missing pieces need to be found, and may we listen well. It’s all about telling your stories, weaving together your memories. It’s booming with the baby boomers. And stories are really important, whether or not we are baby boomers. The stories need to be known, shared, and preserved. Stories matter. Unless, perhaps, it’s not ever having the opportunity, the choice, or the right to know, and then tell, your own story. Some 5 million Americans are adopted. So that means there are about 10 million birth/first parents out there as well, plus grandparents, siblings who weren’t placed for adoption, and so on. They may not have the basic ingredients for a personal history that the rest of us take for granted. Some of this involves genealogy, as well as genetic genealogy. There are lots of possibilities to locate information, to preserve histories, and to share stories. I had the pleasure of presenting a workshop at the annual conference of the Association of Personal Historians. (It was a great conference, and an incredibly nice group of people, by the way.) I’ve interspersed a few of my slides here to give a flavor of the workshop. Adoption and estrangement are not the same thing, of course, but there is overlap: separation from family, disruption of the original family, a disconnect, a loss. This is true for adoptees and for first/birth parents, mothers of loss, siblings who weren’t adopted, and anyone else whose family connections were severed, for whatever combination of reasons. There is a spectrum of responses to these separations and disconnections. Some people are idly curious about the missing parts of their pasts. Some are consumed to the core. Some had very happy childhoods, Some were severely traumatized. For those seeking to learn and tell their stories, that spectrum can affect the way they approach their search for information and the way they process it. In my workshop, I talked about a variety of ways that information can be found these days, even with the absurd restrictions on access to original birth certificates. I talked about the Internet, of course, and the remarkable story of Saroo Brierley and his journey from India to Australia and back, via Google Earth. Saroo’s story is not typical, but it does give hope. There are many ways to gather information, and many ways to tell our stories. I shared information about DNA testing, how that’s enriching our understanding of (and access to) all sorts of information: medical conditions, race/ethnicity, and connections to cousins, maybe even closer relatives. I mentioned search angels, sibling registries, online adoptee/first parent groups, vk.com (the Eastern European Facebook), and more. 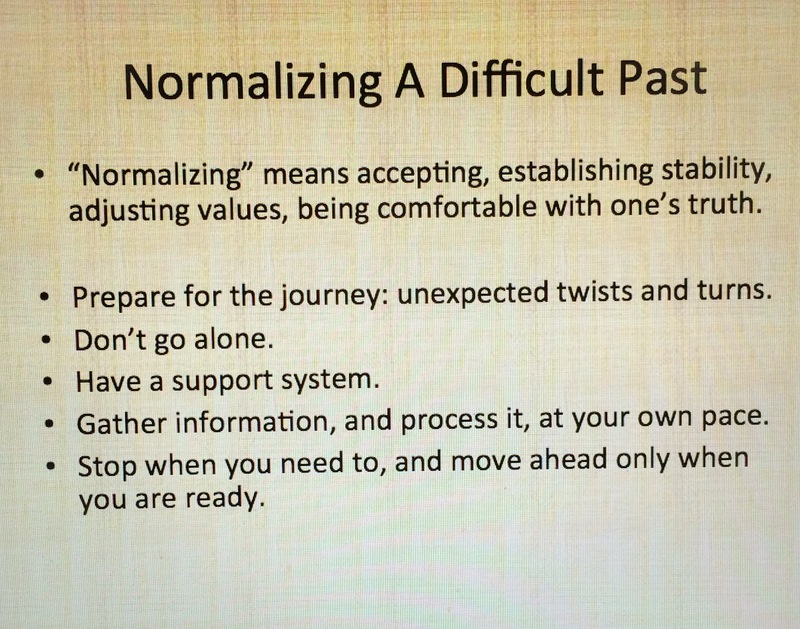 We talked in my workshop about ways to normalize the past, to deal with complicated realities, and celebrate complex histories. As an artist, I also mentioned some less traditional ways of telling one’s stories: through SoulCollage, through The Sketchbook Project, through the book Personal Geographies: Explorations in Mixed-Media Mapmaking, and other means of re-creating one’s past and re-mapping one’s journeys. Adopted persons and birth/first parents should be able to know their own histories and tell their own stories, without shame, fear, or agitation. The stories can be very complicated. Some are sad and painful. They are our stories nonetheless, and it is possible to acknowledge their pain and not be drowned by it. We can learn from them, and share that wisdom with others. 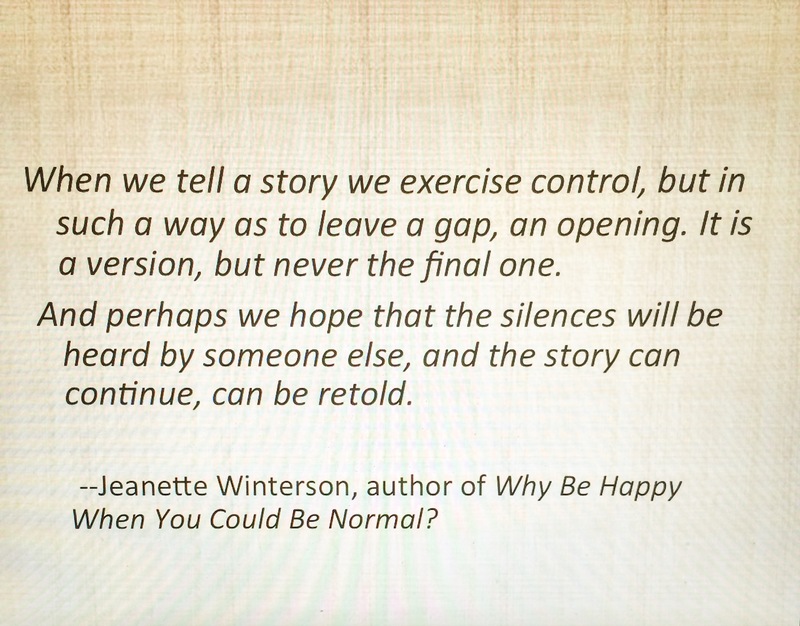 We should absolutely tell the happy, funny, and joyful stories as well, and share them with our loved ones. Among the participants in my workshop were two US adoptees (one a genome expert), an adoptive mother of a girl from China, and a woman whose 80-year-old mother was adopted and wanted to get information about her origins before she died. Each of these folks had a different perspective on the search and the stories, the pressure of time, the ways to share and tell information. Each has possibilities. Starting in January, I will take a year-long, online, mixed media course called Life Book 2014. I can’t wait: the focus of the course will be self-development and healing, and each month a new artist will share techniques and ideas. I wrote about it in this post: Adoption Stories in the Light of Day, Through Art and Hopes of Healing. I’m hoping to build on my work with personal histories and with art, to bring more stories into the light of day, where they deserve to be. I plan to do an online presentation of my workshop, “Adopted and Estranged Families: Rebuilding A Personal History.” I am in the process of developing resources around personal histories for adoptees and first/birth parents. I’ll post details soon on my Upcoming and Ongoing page.